The ex-Prime Minister of the “Donetsk People’s Republic,” Russian national Aleksandr Borodai has admitted that he was involved in setting up Russia’s puppet republics in Donbas before they were officially proclaimed and that in doing so, he was carrying out Kremlin plans. He also accused Ukrainian oligarch Rinat Akhmetov in cooperating with Donetsk terrorists and supporting one of the armed gangs. As Crimea was occupied by Russia at the end of February 2014, Russia established several training camps in Crimea for its militants who were later used to instigate and wage war in the Donbas. After training in one of such camps, an armed gang led by Russian national Igor Girkin (“Strelkov”) captured the Donbas cities of Sloviansk and Kramatorsk in April 2014, later in early June Ukrainian army and special forces recaptured the cities as Girkin’s group retreated to Donetsk. In his interview with segodnia.ru, another Russian national, Aleksandr Borodai, one of the founders of the “Donetsk People’s Republic” (“DNR”) and its former “prime minister“ has admitted that he “was resolving personnel matters” of the “DNR” long before the organization started to control parts of Ukrainian territory. He said that his key mistake was Igor Girkin. 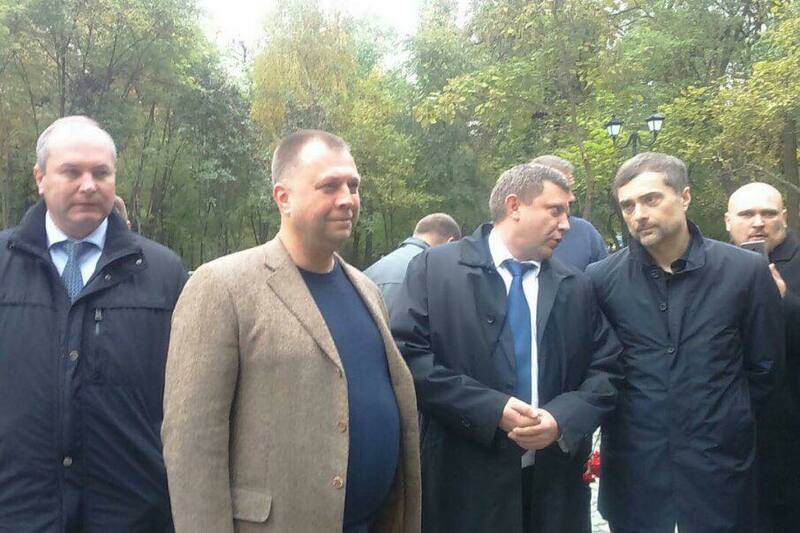 Borodai probably implied that it was he who appointed Girkin as a head of the subversive group to capture Sloviansk. “He [Girkin] wouldn’t get in either Crimea and Sloviansk without me,” said Borodai. In the interview, Borodai laments losing a number of Donbas cities and puts the blame on Girkin. Borodai self-describes as a political consultant, but according to Russian media, in 2002 he was appointed as a deputy director of the Russian FSB State Security, where he held the rank of major general and oversaw the information policy and special projects. Borodai later dismissed this as a hoax, but speaking at a press conference after being appointed as “DNR Prime Minister” in 2014, he declined to clearly state he was not an FSB operative. Back in 2015, Borodai told that Ukrainian oligarch Rinat Akhmetov was supporting the “DNR” militants, and that was the reason why Akhmetov’s businesses functioned in the occupied territory without any problem until they were “nationalized” in March 2017. In particular, he repeated that the “DNR” forces did not take control of the seaport city of Mariupol under their control thanks to an agreement with Akhmetov. The city, which has been living under the threat of an imminent Russian-separatist invasion for four years, was briefly occupied by the “DNR” forces in 2014 but soon fell under the control of the Ukrainian army. According to Borodai, this happened in part so that Akmetov would be able to export the products of his factories in occupied Donbas to companies in the West and thus finance the “DNR.” Ukraine’s alternative Odesa seaport was controlled by rivaling oligarch Kolomoisky who would not allow Akhmetov to use it for that purpose. In the recent interview with segodnia.ru, Borodai hinted that the Russian-separatist forces will still attempt to seize the port, as the “domestic and international political situation has changed,” possibly referring to the nationalization of Akhmetov’s enterprises in Donbas, Ukraine’s blockade of occupied Donbas, and/or “DNR leader” Aleksandr Zakharchenko’s announced plans to sell coal from occupied Donbas to the EU and Turkey. As well, Borodai provided more details on Akhmetov’s alleged cooperation with the occupation authorities and illegal armed gangs. In particular, Aleksandr Borodai disclosed that the commander of the Vostok separatist battalion, former Ukrainian security service commander who switched sides during the Euromaidan Aleksandr Khodakovsky, worked for Rinat Akhmetov. The latter effectively controlled the Donetsk Oblast due to his ownership of its coal mines and industrial objects. Further details were provided in Borodai’s 16 October talk at the “Union of Donbas Volunteers,” an “NGO” advocating support for the Kremlin puppet territories in Ukraine.Borodai claimed that Akhmetov was interested in creating the “DNR” because after the Euromaidan revolution he needed a buffer state to balance between Russia and Ukraine and that nearly all the composition of the first “government” of the self-proclaimed Donetsk “republic” consisted of Akhmetov’s men. One of the tasks of Borodai’s unit of Chechen mercenaries was to thwart Akhmetov’s influence on the fledgling “DNR.” The other tasks, Borodai claimed, still can’t be named. Borodai claimed that one of the tasks of those who started the “Russian spring,” i.e. the Russian post-Euromaidan invasion of Ukraine attempting to break it in two, was to prevent the “DNR” from coming under Akhmetov’s control. The $500,000 in the suitcase were ostensibly a bribe presented to Borodai so he would not carry out his plans. While Igor Girkin is a self-described FSB colonel and leaves no doubt as to his Kremlin connections, Borodai always shrugged off the FSB allegations. His connections to Putin’s aide Surkov, who is ostensibly the chief architect of the “Russian spring,” were exposed in a batch of Surkov’s leaked emails known as the Surkov leaks: in them, Borodai sends a report on the operations of his “Union of Donbas Volunteers” to Surkov and complains of political infighting to Alexei Chesnakov, a Russian political figure close to the Russian government who reportedly oversaw the operations of the press centers of the “DNR” and its sister “republic,” the “LNR.” However, many analysts said there was no clear proof of a hand of Moscow behind Borodai. Borodai’s recent revelations, however, remove any shadow of a doubt. The initiators of the “Russian spring” a.k.a. “Novorossiya” are sitting in the Kremlin, telling evidence of which is a Ukrainian security service intercept which shows that Putin’s top advisor Sergey Glazyev coordinated the separatist uprisings in Crimea and southeastern Ukraine. If Borodai’s unit was to implement the will of those who started the “Russian spring,” then it was subordinate to them. If he made personnel decisions for taking over Crimea and Donbas and made a mistake in appointing Girkin, then he was given the power to do so. Once again, a warlord of occupied Donbas admitted he is not a “rebel leader” but carrying out the Kremlin’s plans.